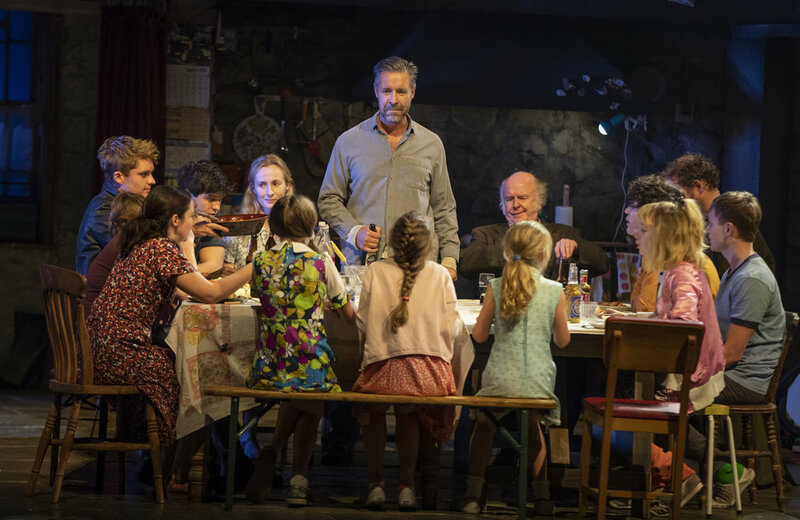 It is a long day’s journey into night for the Carney Family of County Armagh, Northern Ireland, but three hours and 15 minutes have never flown by as quickly in a theatre as they do at “The Ferryman”, nor felt more ecstatic and full. This is the rare kind of play that manages to successfully capture the totality of human existence—the tangle of relationships, the grip of history, and the politics of the moment—through the lens of a single event, or culmination of events, here the intimate domestic effects of a large sectarian conflict on a large family. The result is nothing short of thrilling, and sets a high bar for this, or any, Broadway season. But for a brief prologue set in Derry the previous day, the balance of this exquisite and ravishing new play by Jez Butterworth (“Jerusalem”), and directed by Sam Mendes (“Cabaret”), is set in the cozy if unkempt farmhouse home of the sprawling Carney clan on one fateful harvest festival day in late August 1981. It is a war-weary time in the long-brewing Irish sectarian conflict known as “The Troubles”, five months into the hunger strike of Irish republican political prisoners in HM Prison Maze that would result in nine of their deaths. The air is thick with tension and despair. But while death stalks and blood is shed, the Carney home in rural County Armagh is full of life, warm and bustling with energy, idyllically removed on the surface but simmering just beneath. Patriarch Quinn Carney (Paddy Considine) leads a brood of seven children, ranging from nine months to 16 years, his perennially-ill wife, Mary (Genevieve O’Reilly), sister-in-law, Caitlin (Laura Donnelly), nephew Oisin, (Rob Malone), colorful (read: inebriated) Uncle Pat (Mark Lambert), sternly political Aunt Pat (Dearbhla Molloy), and mostly invalid Aunt Maggie “Far Away” (Fionnula Flanagan) all living under one, presumably thatched, roof. Paddy Considine (Quinn Carney–center, standing), and the company of “The Ferryman”. Photo Credit: Joan Marcus. Gentle giant, Englishman Tom Kettle (Justin Edwards), lives on the grounds and works as their handyman. Three Corcoran cousins from the city join for the harvest festivities. And Father Horrigan (Charles Dale), a priest of questionable morals, drops in, as does Muldoon (Stuart Graham), a menacing Irish Republican Army (IRA) leader, and two of his henchmen (Dean Ashton and Glenn Speers)—all totaling a cast of 21. And that’s not including the goose and the rabbit (they’re real), and the three scene-stealing infants who take turns as nine-month old Bobby Carney (the baby I saw was **really** good). “The Ferryman” is a big play—in every sense of the word, from its length, to its cast size, to the sweep of its subject matter, and the grandness of its towering set by Rob Howell. It is ambitious in scale, and rewarding in delivery. While surprise remains an essential tool of good drama, and explicit spoilers would ruin the sheer joy of watching “The Ferryman” unfold, I can share that the plot centers around the disappearance of Quinn’s brother—and Caitlin’s husband—Seamus Carney on New Year’s day 1972. A twenty-year old foot solider of the IRA, after being vanished for nearly ten years, his body is suddenly found “pickled” in a bog in County Louth, a solitary bullet in the back of his head. The play is actually inspired by the harrowing true story of cast member Laura Donnelly’s uncle, an IRA member who went missing and was later found dead—one of many such “vanishings” common to the era. This news jolts the precarious domestic arrangement of the Carney household—one man, two women, eight children, three elders, and a “foreigner”—forcing secrets to be revealed, the past to be confronted, and tragic choices to be made. If that sounds opaque, you will thank me after seeing the play for not giving too much away. Niall Wright (James Joseph (JJ) Carney), Matilda Lawler (Honor Carney), Justin Edwards (Tom Kettle), Mark Lambert (Uncle Patrick Carney), Fra Fee (Michael Carney), and Willow McCarthy (Mercy Carney). Photo Credit: Joan Marcus. Laura Donnelly (Caitlin Carney), Genevieve O’Reilly (Mary Carney), Sean Frank Coffey (Bobby Carney), and Paddy Considine (Quinn Carney). Photo Credit: Joan Marcus. “The Ferryman” calls to mind another big play of recent vintage, Tracey Letts’ Tony and Pulitzer Prize winning “August: Osage County”, which stormed Broadway in 2007, and rightly so. Like “August”, “Ferryman” features a big cast, three acts, and a stunning domestic drama loaded with melodrama and suspense and centered around the suspicious death of a family member. Heck, they’re both even set in August. Also like “August”, “Ferryman” generously trades in dramatic cliché, leaning heavily on well-established plot and character tropes. That is not a criticism so much as an observation, because its saving grace is that it does it all so well. Dramatic forms exist for a reason: they work. What is exhausting is when their use is naked and lazy, a substitute for craft. Here, Mr. Butterworth, a spectacular writer, employs familiar types and conventions to thrilling effect, at once shocking in content and comfortable in delivery, aided by Mr. Mendes’ incisive touch, and an impeccable ensemble. Outside of understanding the historical context of the play, it is easy and enjoyable to swallow. The entire play is structured as one chaotic slow boil—three scenes in three acts, plus a prologue—toward a climax as memorable as any I’ve ever experienced in the theatre. What is important, though, is that the action never stops moving toward that finish, the tension ceaselessly building as the audience is constantly engaged by the smartly woven threads of information shared and the sheer, truthful humanity inhabiting the bounteous character interactions displayed on stage. “The Ferryman” premiered at The Royal Court in London in May 2017. Mr. Mendes has thankfully re-assembled most of the play’s acclaimed original cast members for this Broadway production. I was fortunate to catch the play in its West End transfer last year, and was equally as enthralled this time. On second viewing, though, I agree with critic Helen Shaw that the play’s center of gravity really ought to be Caitlin, not Quinn. The male focus is one timeless convention I could do without. That said, “The Ferryman” is a titanic dramatic achievement and a must-see event of the season. In short: a masterpiece without present peer on Broadway. Bottom Line: Jez Butterworth’s “The Ferryman” is an ecstatic and richly thrillingly new play about the intimate, domestic effects of “The Troubles” on one large, Irish family; a sprawling epic with a 22 person cast and running time over three hours, “The Ferryman” is a titanic dramatic achievement, and a must-see event of the season. In short: a masterpiece without present peer on Broadway.